Procter and Gamble is a classic example of an action-oriented consumer goods company. Not only have they laid down efficient strategic and sustainable long-term goals but also have achieved success in accomplishing their short-term goals. 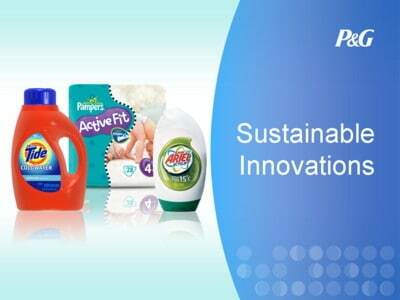 P&G has taken assertive initiative by delivering the best of services and products by incorporating sustainable and environment-friendly methods. Products: By using life cycle analysis, they track and target their innovation techniques. Operations: By focusing on creating efficiencies in energy, water, waste, and emissions. They have touched varied sectors and have brought significant change in the current environment scenario. They have shown marginal reduction in energy consumption, CO2 emissions, disposed waste, and water consumption. This distinctly represents how their green practices are reducing the load on the environment. Their plants across the world have Solar, Wind, Biomass, Geothermal and Co-Generation categories of alternative energy technologies installed. 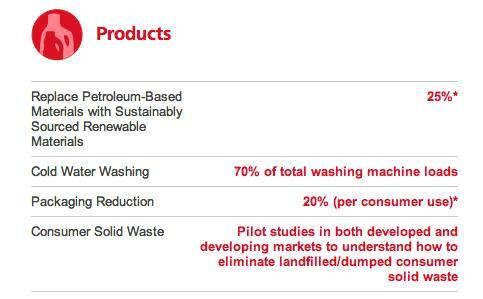 P&G has taken up Global Asset Recovery Purchases Program (GARP) through which they re-use scrap and waste material. At the same time, they have ensured that from their product aspect, there is a categorical reduction in packaging material. For instance, P&G partnered with Be Green® Packaging, a molded fiber supplier, to develop a breakthrough package for Fusion ProGlide, Gillette’s newest high-performance razor. Moreover, P&G uses renewable and recycled materials, such as plant-based plastic, in their products and packaging. Procter and Gamble has taken equal efforts in handling external factors along with internal ones (product and operations) which can in turn reduce their contribution towards carbon emission. This involves product compaction and thus reduces waste, transportation costs and pollution. There are retailer benefits also because fewer trucks, fewer pallets, and less inventory space results into a more efficient supply chain. One commendable step that is taken by the company is to come up with alternative products from wastes and scraps. They have propagated the concept of zero manufacturing waste mechanism where scrap produced is utilized and is converted into useful items. Excess floss is repurposed in Mexico as the filling in pillows that are used to cleanup industrial spills. In Thailand and China, the waste left over from the manufacturing process is combined with clay and coal ash and heated to make bricks. Even in developing nations like India, scrap pads are recycled into plastic soles to make low-cost shoes. Undoubtedly, Procter and Gamble has taken over the global market yet again, but this time with a strenuous backbone of sustainability.